For other uses, see Wrangler (disambiguation). In North America, a wrangler is someone employed to handle animals professionally, especially horses, but sometimes other types of animals as well. The word "wrangler" is derived from the Low German "wrangeln" meaning "to dispute" or "to wrestle". It was first documented in 1377. Its use as a noun was first recorded in 1547. 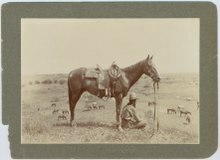 Its reference to a "person in charge of horses or cattle" or "herder" was first recorded in 1888. In the film industry, a wrangler is also one who professionally searches for and/or handles particular products on film and television programs, and music videos, such as custom cars or animals.